Perennials, 5-25 cm; taprooted, caudexlike branches relatively thick, woody. Stems ascending (without axillary tufts of leaves), glabrous, eglandular. Leaves cauline (all commonly withering early in season); proximal blades oblanceolate to narrowly oblanceolate, 20-50(-100) × 0.5-1(-15) mm, abruptly reduced distally, becoming linear to filiform, mid and distal shorter than internodes, margins entire, usually eciliate, sometimes sparsely ciliate, faces sparsely and minutely strigose or glabrous, eglandular. Heads 1(-3). Involucres 4-5(-6) × 7-12 mm. Phyllaries in (3-)4-5 series (inner with (1-)3 orange veins, margins of inner narrow, scarious), usually glabrous, outer sometimes sparsely strigulose, minutely glandular. Ray florets 12-27(-45); corollas white to lavender or blue, 6-9 mm, laminae slightly coiling at tips. Disc corollas 3-4 mm (throats slightly indurate, not inflated). 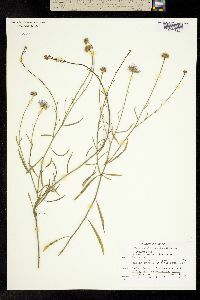 Cypselae ca. 2 mm, 2-4(-5)-nerved, faces sparsely strigose; pappi: outer of setae, inner of 17-25 bristles. 2n = 18. Flowering (Feb-)May-Jun(-Nov). Rocky hillsides around seeps or springs, canyons, cliff bases, among boulders, often with Acacia-Yucca-Coleogyne; 700-1100 m; Ariz., Calif.; Mexico (Sonora). Erigeron oxyphyllus is a member of sect. 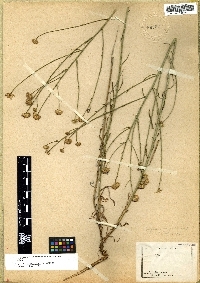 Pycnophyllum and is set apart from the rest of the section by its cauline leaves, sharply reduced in length distally, and by its more southeastern geographic range (versus the California-centered distribution of the rest of the section).